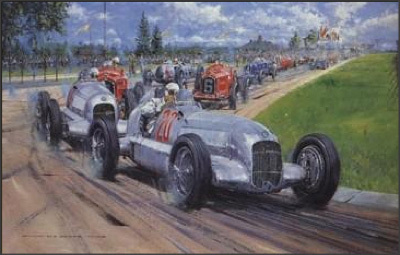 Manfred von Brauchitsch leads Luigi Fagioli, both in Mercedes Benz W25A’s, at the start of the 1934 Eifelrennen. Initially the cars had been painted white but exceeded the new 750 kilogram weight limit. The decisiion was left to the charismatic team manager Alfred Neubauer who ordered his mechanics to strip the paint from both cars. Hence the legendary ‘Silver Arrows’ were born. Subsequently the race was won for Mercedes Benz by con Brauchitsch, defeating official entries from Auto Union, Scuderia Ferrari, Maserati, and Bugatti. Nurburgring, June 3rd 1934.